A few decades ago, cosmology was a very data-starved science with many speculating theories. But as we have entered a new era of powerful instruments, cosmologists are presented with high quality data: now we have the capability to actually test the theories. 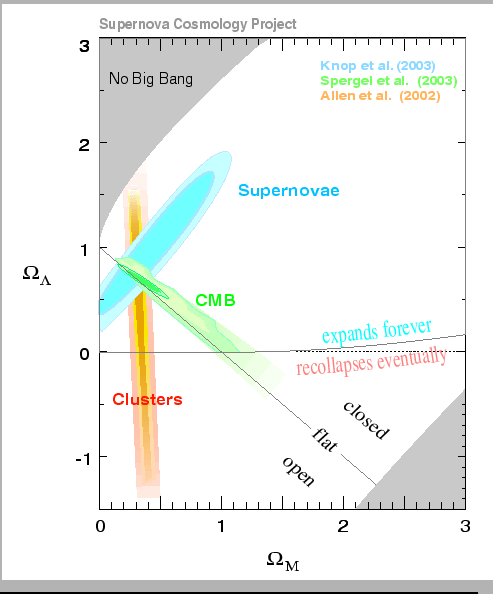 Recent measurements of the cosmic microwave background (CMB) combined with supernovae of type Ia, cosmic shear, and galaxy cluster abundances show that of the Universe consists of the so-called dark energy, and of cold dark matter. Ordinary baryonic matter, in the form of gas and stars, only makes up . If these measurements and their interpretation are correct, our Universe is spatially flat, as predicted by inflationary models. Furthermore, the Universe is dominated by a mysterious dark energy, which causes the cosmic expansion to accelerate. The geometry of the Universe is determined by its curvature which can be positive, negative or zero. In these cases, the Universe is called closed, open or flat, respectively. The curvature on the other hand is governed by the total matter and energy content. For the so-called critical density , the Universe is flat. 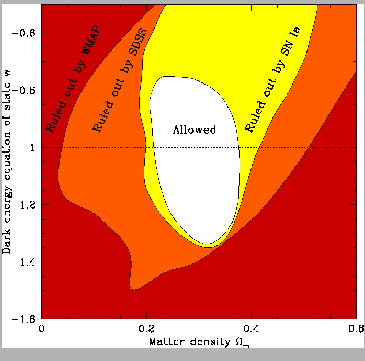 If the total density is larger (smaller) than the critical density, the Universe is closed (open). 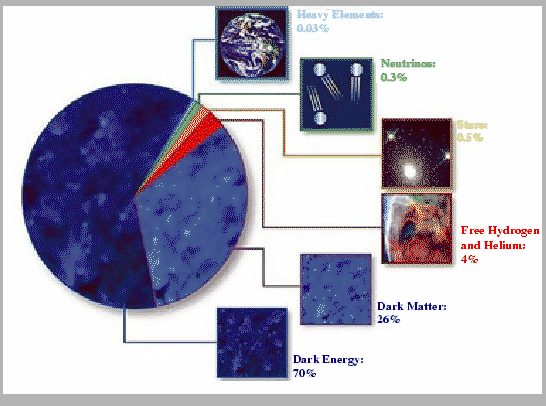 The contents of the Universe can be expressed in units of . One usually defines the cosmological parameters as: (dark energy), (cold dark matter and baryons) and (baryonic matter). 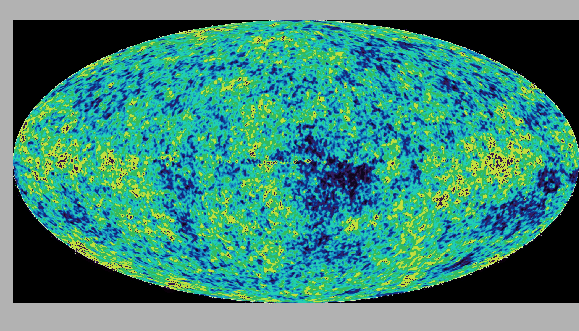 The scale of the CMB fluctuations directly indicates the curvature of the Universe and therefore the total density . Dark energy started its long history in 1917 and was introduced by Albert Einstein. A constant (which he called ) was needed in his equations of General Relativity in order to allow for a static Universe. But shortly thereafter, when Hubble made his famous discovery of the expansion of the Universe, this constant , now seeming an unnatural and superfluous admixture, was rejected, even by Einstein himself (although his often cited ``biggest blunder in my life'' most probably is a myth). Later, when quantum theory was developed, it was realized that ``empty space'' was full of temporary (``virtual'') particles continually forming and destroying themselves. Physicists began to suspect that indeed the vacuum ought to have a dark form of energy, and that Einstein's could be interpreted as vacuum energy. But when they tried to estimate its value, they disagreed with observational limits by 120 orders of magnitude, making this the most erroneous estimate in physics ever. was forgotten by most astronomers for nearly 70 years. Most interestingly, was unearthed in the 1990s in order to reconcile theory with observations. Nowadays it has become fashionable to call ``dark energy''. Dark energy acts as a repulsive force, or anti-gravitation. It is responsible for the acceleration of the Universe today. 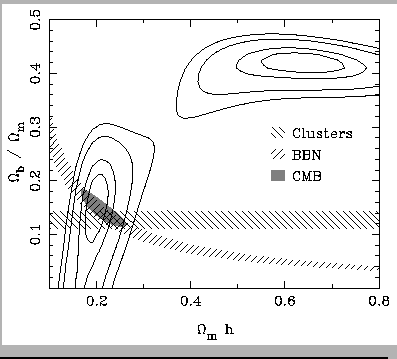 Alternative models such as quintessence characterize dark energy with the equation-of-state where usually . 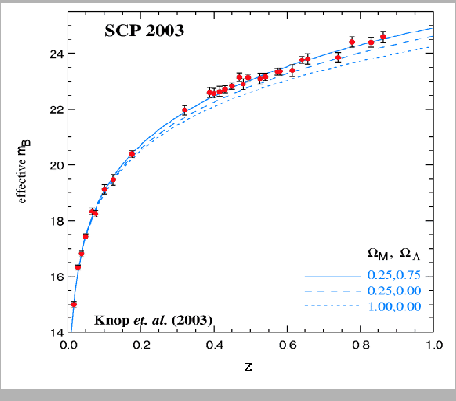 However, these models still struggle with their numerous difficulties, and current observational limits ( at % CL) point towards a true cosmological constant ( ). Dark energy is distributed homogeneously in the Universe -- it does not cluster like matter. Changes in the cosmic expansion rate can be studied with the observed brightness-redshift relation of type Ia supernovae (SNe). With the recent measurements of these distant exploding stars, the existence of dark energy has begun to gain broader consideration. Type Ia SNe are currently the best candidates for standard candles. They have the advantage of having a high luminosity and thus can be seen at cosmic distances. As a class, type Ia SNe are not equally luminous, but one can calibrate them with nearby SNe according to their brightening and fading. Using type Ia SNe as standard candles to gauge the expansion of the Universe, observers have found that it is currently accelerating. A cosmic dark energy will cause the expansion of the Universe to speed up. The results are most sensitive to the difference between (which decelerates the expansion) and (which accelerates the expansion). The supernovae data alone is accurate enough to exclude a vanishing at high significance. But there is more evidence. A precise determination of cosmological parameters comes from the measurement of the cosmic microwave background (CMB). According to the Big Bang model, the early Universe consisted of a hot gas of baryons and radiation. In this plasma, sound waves were generated which created density and temperature fluctuations. years after the Big Bang the temperature of the Universe cooled down to so that the hitherto ionized Universe became neutral. The now freely streaming photons still have the temperature fluctuations imprinted. These photons are redshifted by the expansion of the Universe to today's temperature of and form the CMB. 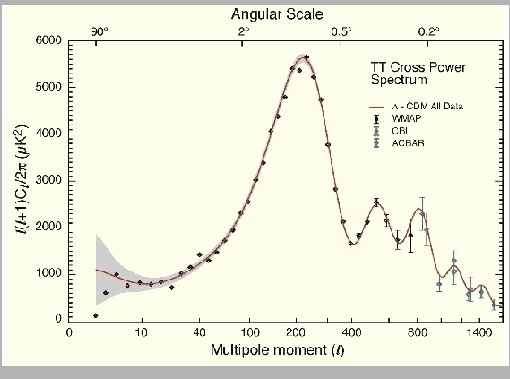 Measuring the angular scales and heights of the temperature fluctuations in the CMB, expressed by the so-called angular power spectrum, one can directly determine the overall curvature of the Universe. If the curvature is positive (negative) the scales appear larger (smaller) on the sky compared to a flat Universe. This will result in a shift of the first dominant peak in the power spectrum. For a flat Universe, the characteristic scale of density fluctuations is , resulting in a power spectrum peak near . A number of different, independent observations such as galaxy surveys or the determination of cluster abundances, together with measurements of the baryon density inferred from Big Bang Nucleosynthesis (BBN) indicate a low-density Universe with . This implies that only a third of the critical density is present in matter. 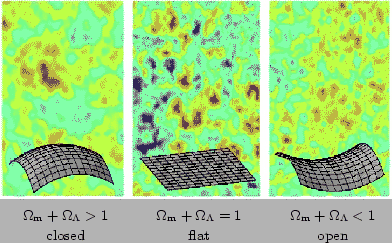 But from CMB experiments such as WMAP, we know that our Universe is flat and therefore has indeed the critical density. Thus, there must be a missing dark energy component to fill the gap, in agreement with the SNIa results. The equation-of-state parameter indicates the connection between the pressure and the density of dark energy, via the equation . A pure cosmological constant requires , quintessence models typically have . Both possibilities are still compatible with observations. With high-precision cosmological observations we are now able to deepen our understanding of the Universe. For the first time we know the composition and geometry of our Universe in great detail. Although there is still some skepticism, a standard model of cosmology has emerged and seems to be consistent with all observations. We have very strong indications for non-vanishing dark energy, and the accelerated present expansion of the Universe has been measured. But we still do not know the physical nature of dark energy, and no theoretical model has succeeded to explain it convincingly. The mere existence of dark energy will open a window to new and unpredictable physics. It is only by astronomical experiments that we can hope to enlighten the dark energy mystery. We live in a very exciting time where fundamental changes in the understanding of our world might be just around the corner. A * indicates a review paper.